In a recent email to some of you I said I would be posting a blog soon about a hero I saw during the aftermath of the hurricanes that came our way. Unfortunately that email was 11 days ago and I'm just now getting around to posting about it. Sorry - I hope you didn't hold your breath! OK, so here goes - on the right you can see the picture of a brave Cleco employee, standing knee deep in a drainage canal using a long pole to reconnect power to a home. (If you look closely, you can see the property owner standing on the right observing the work - don't you just love it when people watch over your shoulder? :-) Click on the picture and you'll see a larger view.) The technician was wearing rubber boots and the water was within an inch or two of going over the top of his boots. 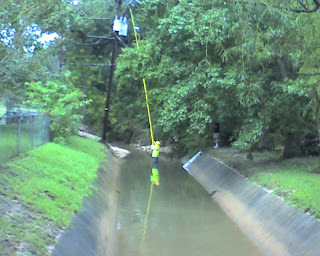 I'm sure the pole was made of some sort of non-conductive material, but the idea of standing knee-deep in water while using a pole to reattach a fuse on a transformer that conducts hundreds of watts/volts/amps (whatever!) of electricity is not my idea of a fun day at the office! 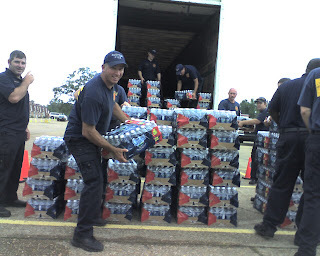 I think we should salute the heroes among us - the firemen and policemen who coordinated their efforts to provide much needed water, ice and food to hundreds of Cenla residents; the public works employees who worked around the clock to remove debris from the roads and opened stopped drains in the middle of the night; the utility crews who restored electricity to hundreds of thousands of homes in record time; the elected officials who went days without sleep, coordinating relief efforts, and sometimes getting into the thick of things themselves to help rescue flooded residents; the media who demonstrated incredible cooperation to keep everyone informed; and the neighbors who lent a hand when others needed it. It's great to live in a town of heroes! Some of them were compensated for what they did. Others helped out because it was needed. Some of the efforts were highly coordinated. 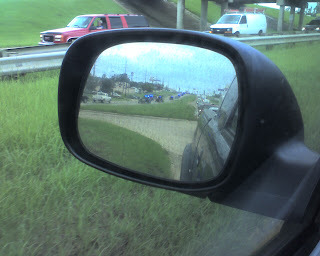 (See the picture on the right of a caravan of Department of Wildlife and Fisheries vehicles as seen in my mirror, on their way to help folks. Click the picture for a larger view.) Some of the efforts were not-so coordinated. But people stepped up. They lent a hand. They helped each other. We were pretty impacted by Gustav, and somewhat by Ike. There are still scars in our community - fallen trees, wounded structures, lost landmarks. But we will recover, we will rebuild, we will move forward. And we will do this because of the heroes in our midst. So next time you see a police officer, a fireman, a public works employee, a utility worker or someone who helped, say "thank you. Thank you for being a hero. We won't forget you." 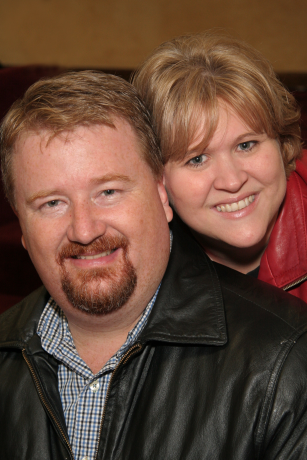 Thanks for being there for CCI and the community at large!